Glocks need no introduction. Almost everyone loves them: they’re versatile, perfect for both self-defense and concealed carry, and host the biggest market for parts and components. If you want to focus on concealed carry, though, you’ll want to cut through the noise. Read on to discover how to maximize your Glock concealed carry setup, as well as the best options on the market today. What Makes Glocks a Great Concealed Carry? The ease of concealing a Glock is one of the many reasons it enjoys immense popularity amongst handguns. It starts with the small size. Glocks come in a range of models, some more concealable than others, but all well-suited for this purpose without sacrificing ease of use. Additionally, their popularity has created a huge aftermarket for concealed carry accessories, not the least of which is holsters, of course. There are almost as many holsters as there are gun owners, so you can easily find something with a low profile that’s comfortable for you. Another big reason is how easy Glocks are to use. Those interested in concealed carry are often not the type who enjoy shooting for sport or hunting. Some may only care about staying “fresh enough” to defend themselves. Glocks are quick to adapt to and provide reliable performance when a concealed carry weapon needs to be taken out to save your life. Just because Glocks are universally adored for their edge in concealed carry doesn’t mean you should haphazardly purchase just any Glock. Particularly if you’re new to handguns, you should spend some time contrasting the different models. 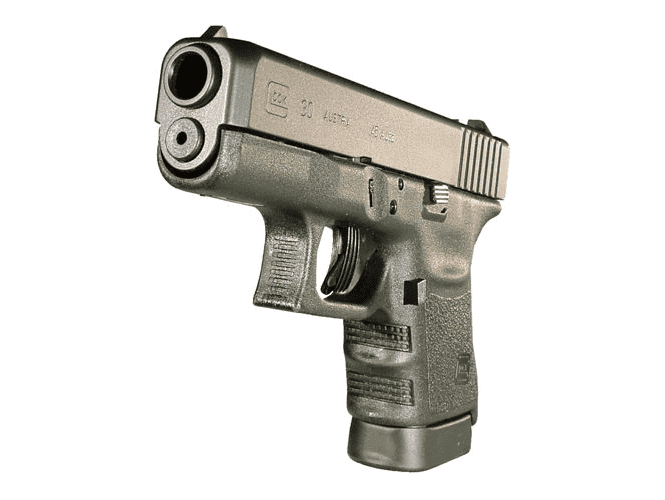 In the following reviews, we’ll examine the strengths and weaknesses of the best models on the market so you can choose the best concealed carry Glock for your needs. Hands down, the most popular and recommended pistol for concealed carry among Glock models is the Glock 19 semi-automatic pistol. It is not only geared towards concealed carry but also is excellent for novices and trusted by law enforcement professionals the world over. Simply, it’s well-rounded, and that’s what makes it so perfect. It’s smaller and more concealable than other Glock models, but not so small that the average user will have a harder time using it—models like the Glock 26, for example, are more ideal for those with smaller hands. Compared to larger models, it only sacrifices two rounds for this smaller size, and yet at a ten-round capacity, you will need to load substantially less often than with other handguns, which matters, as you’ll be able to hit your target or take down a group without having to reload. Of course, it’s also rugged. Made from high-strength polymer and resistant to corrosion, extreme temperatures, and shock, it is ready for any environment. A Tenifer treatment protects it from perspiration when held close to your body. But perhaps most important of all, it simply works. Without the need for special care, a Glock 19 can withstand even the most careless gun owner’s habits. The Glock 19 can operate in the pouring rain, when dirty, and without constant cleaning or the implementation of custom springs, feed ramps, or routine oiling. We’re not saying not to take care of your Glock. You should. But the G19 has earned its reputation as immensely reliable, which is why for concealed carry, it should top everyone’s list regardless of how familiar you are with handguns. It’s hard to fault the Glock 19. As the ultimate utilitarian handgun, it’s easy to use, reliable, affordable, and comes with a huge aftermarket for parts. It should be everyone’s starting point. The Glock 23 is another excellent option. As it is a Glock, it shares many similarities with the G19, such as a rugged construction that is resistant to shock, corrosion, perspiration, and heavy abuse in general. You can also expect the same level of reliability as you can from the G19, so we won’t repeat ourselves. There are key differences. The G19 is designed so that it’s a great fit for just about everyone. It’s the happy middle ground. 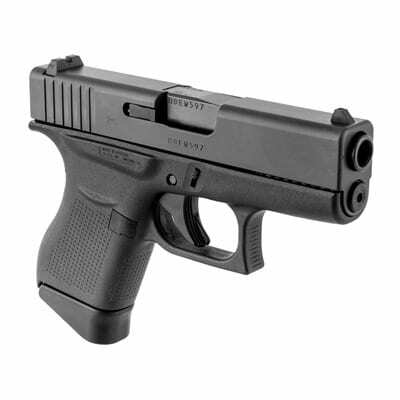 The G23 is a bit larger, and as such, it is slightly more difficult for a concealed carry. However, for people who are larger, this is advantageous. First off, a larger person concealing a larger handgun is generally not more difficult nor more uncomfortable, as there is a larger body mass. A larger gun does, however, mean a longer grip, which is perfect for larger hands. That said, it also features a short 4.02” barrel and weighs only 1.44 pounds, meaning it is still optimum for concealment and fits with a wide variety of holsters. A standard magazine contains ten rounds, as with the G19, and it fits within the same price range. It is also easy to use, and some find it to be a bit more accurate than the G19, although any difference will be negligible to novices and the primary difference comes down to size and comfort for those just starting out. 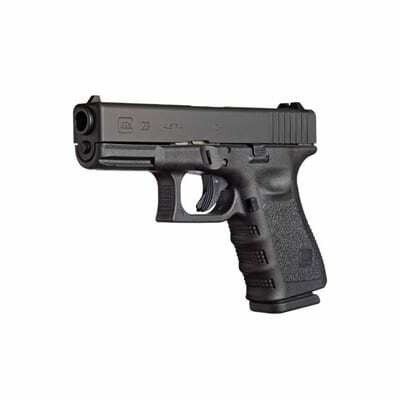 A very comparable alternative to the Glock 19, the Glock 23 is another exceptionally popular model with great durability and performance, with a larger grip that does not impede concealability. You might think our next choice is going to be a smaller variant of the Glock 19, but in fact, it’s sub-compact all around. While the Glock 19 and Glock 23 are designed to be the perfect handgun for just about anyone, the Glock 26 is specifically designed for concealed carry. This means that not only is the grip smaller—and incidentally, perfect for people with smaller hands—but every component has been whittled down to a minimum, including a 3.42” barrel. That said, it uses the same durable construction that’s resistant to shock, corrosion, and whatever else you can throw at it. Even the internal mechanisms have been retained, although a double-spring recoil assembly has been taken from later-generation Glocks to support its size. Despite its size, it can still retain a standard ten-round magazine. Its small size obviously makes it great for those with small or very small hands, but even those with normal-sized hands may wish to try the Glock 26 due to its impeccable ability to be concealed. Due to its size, even those who find concealed carry to almost always be uncomfortable will find that the small footprint and three-pound weight of this handgun lend themselves exceptionally well to all situations. That said, if holstering isn’t your thing, with a three-inch barrel, if you can hide this pretty much anywhere you can hide your cell phone. The Glock 26 is something of a marvel in how it retains the same durability and reliability as other Glocks and even features the standard ten-round magazine while staying smaller than even some modern cell phones, making it an optimum concealed carry option. The Glock 30 is an excellent option for those who have a little more experience with handguns but still want the best in concealed carry. As it provides access to the .45 ammunition, it packs a stronger punch, but does so in a small frame that is easily concealable. It is still quite small—the barrel is 3.77”, putting it on the smaller end of the spectrum for Glock models—and is part of the SF line, which stands for Slim Frame, allowing for a tighter profile that is great for carrying inside-the-waistband. At 3.35 pounds, it is light and comfortable. Having the knock-down power of a .45 in a frame this small is simply an incredible feat. 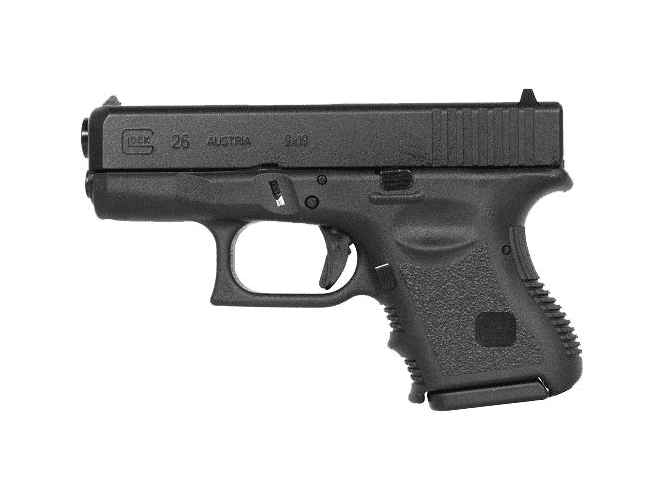 Of course, Glock did not take any shortcuts (after all, this is the company that can create the incredibly small G26 without cutting corners), and so its rugged polymer construction retains resistance to shocks, moisture, and corrosion. It performs reliably under all conditions. The Glock 30 is also renowned for its accuracy, with many users often reporting that they prefer the Glock 30 SF due to its ability to hit the target more precisely and consistently. This is excellent for more advanced users seeking a concealed carry weapon that can double for other purposes, but the novice will likely want to avoid it due to the added kick. Of course, with proper training to ensure perfect form, it’s possible to overcome recoil concerns, but it’s not as easily adaptable as other models that do not use the .45 rounds. 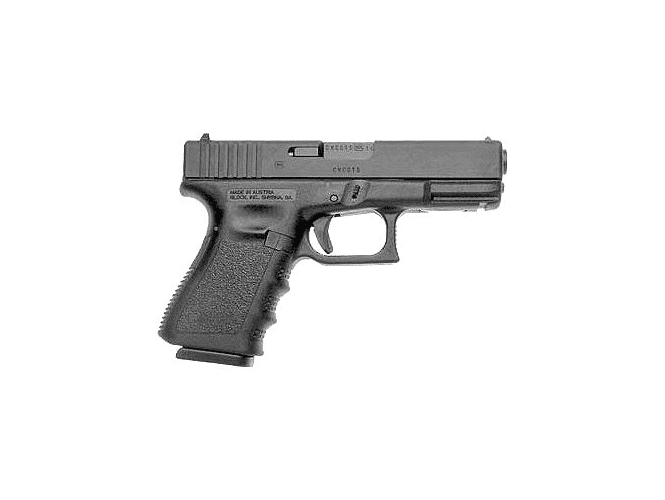 While excellent for any user, the Glock 30 provides exceptional firepower in a tiny package, making it great for those who are experienced with handguns and venturing into concealed carry. The Glock 43 is a newer model from Glock, attempting to push both the boundaries of size and concealability while staying utilitarian and comfortable for a wide range of owners. For starters, it is an incredible 1.02” wide, making it one of the slimmest handguns out there. It weighs just a hair over a pound, making it lightweight. The barrel is 3.39” in length, with a total length of 6.26”. For reference, most cell phones in use today are 6” in height or longer, making this very easy to conceal. Its height is where it attempts to find balance. At 4.25” tall, it provides about 3” of gripping area, which should be comfortable for most users. It also weighs a featherlight 1.13 pounds unloaded and the 9mm rounds will not add substantially to this. The tradeoff is that a standard magazine holds six rounds, which, if you’ve been paying attention, is just over half the other standard magazines. Now, you could easily get an extended magazine, but given we’re looking at concealment, it does negate the 4.25” height to have a higher-capacity magazine. In designing this handgun, it seems that Glock was able to make it compact by moving some of its width into height, and then reducing the magazine capacity. That said, it isn’t necessarily a problem. We’d recommend getting an extended magazine to give you another couple of rounds and accept that you will minimally be adding to the height. You still get a shockingly thin and compact handgun. Of course, like all Glocks, it is made from a rugged polymer that resists moisture, corrosion, and shock, and performs beautifully under all conditions. Though you’ll likely want to opt for an extended magazine, the G43 remains one of the thinnest and more compact models on the market while still being comfortable to handle. Glocks are naturally great for concealed carry, but there are a wide variety of Glocks on offer. Choosing the perfect Glock for concealed carry means having a reliable handgun that meets your needs when it matters most. Use our guide to determine what to look for and find your own from the best on the market today. Especially for new or would-be gun owners, common questions about concealed carry are taken for granted by experienced gun owners. Don’t worry—we’ve got the answers. No matter where you are on your path to ownership, every question deserves a good answer. What is the Difference Between Open Carry and Concealed? Open carry means carrying your Glock or other gun model where it can easily be seen by the general public. 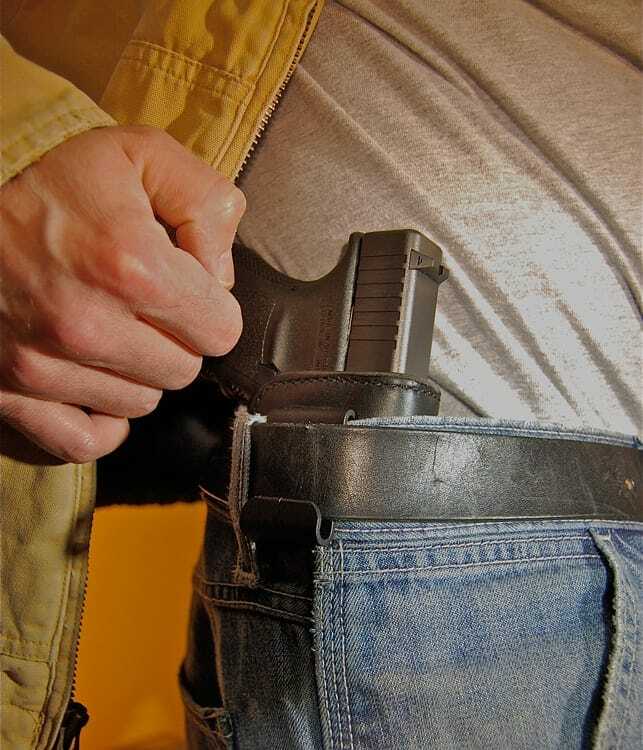 The most common way to do this is with a holster that attaches to the outside of your belt. Concealed carry means hiding the fact that you have a weapon from the general public. The most common way to do so is with a holster that rests inside the belt and is covered by clothing. Can You Conceal Carry Any Pistol? Technically, you could conceal carry anything. Whether you practically or legally can is another matter. First off, whether you can conceal carry a gun at all is up to your state’s laws, so you should be sure your state allows concealed carry. Aside from this, pistols that are too large or not designed for concealed carry will not fit many holsters or will simply be uncomfortable. This is why certain models, such as Glock, are revered for concealed carry, as they are specifically designed for it. You might be wondering why anyone would want to hide the fact that they’re equipped with a weapon. The simple answer is that you have a right to—in states where it’s recognized, anyway—protect yourself without it being anyone else’s business. Would-be criminals are theoretically more likely to target, or at least be prepared for, those who clearly are carrying guns before committing a crime. Concealed carry means countering them by surprise. Which Caliber is Best for Concealed Carry? There’s no single right answer to this, but there are certainly wrong answers. First off, you want a caliber capable of at least stopping an assailant, if not dropping them. However, a caliber that gives your Glock a lot of kick might be doing you more harm than good if you don’t practice often and can’t shoot straight. The best answer is to practice and experiment with different calibers, but you should start out sticking to common ammunition such as 9mm, .40, or .45 ACP. Just as important is the quality of ammo, however, to prevent misfires and jams. Can I Carry a Gun in my Car Without a Concealed Weapons Permit? Be careful about this, as it depends on what state you are in, and you don’t want to cross state lines and accidentally run afoul of the law. In short, this is referred to as “constitution carry,” and is allowed in Alaska, Arizona, Arkansas, Idaho, Kansas, Maine, Mississippi, Missouri, Vermont, West Virginia, and Wyoming. However, Idaho and Wyoming only allow residents to do so. From there, it greatly depends on the specifics of your state whether you can drive with a gun at all, and with or without a permit. Always check your state’s laws, and never make assumptions. Whenever possible, get a permit even if you don’t think you’ll need it to stay safe.